I would say, along with Valentine’s Day, the festive season is the most popular time for couples to get engaged. So for those of you who are celebrating getting engaged over Christmas and New Year period, let the fun begin! How big should you have your wedding cake? Well, this all depends on how many guests you’ll be having. I often scale the size down a touch as not everyone will want to eat cake and it would be a crime to throw any away! If you’re having a relatively small wedding but want a gorgeous centrepiece I supply dummy tiers which are decorated the same as the rest of the wedding cake and give the illusion of it being all cake. How about the actual cake flavours inside the cake? We have 13 yummy cake flavours on our menu, plenty of choice for every discerning taste! I often encourage our couples to mix it up; if you decide on a 3 tier cake for instance, I’d say have 3 different flavours – a ‘safe’ choice, one that is popular with everyone, perhaps a chocolate cake (who doesn’t love chocolate cake?!) and your favourite flavour… it IS your day after all. What about the decoration on the cake? I love all things floral, being an ex-florist, so at Sticky Fingers Cake Co our signature style of cake is very pretty, floral and vintage. I love producing stunning sugar flowers and like to introduce the flowers you’re having in your bouquet onto the cake in sugar form but you can always have fresh flowers on your wedding cake if you prefer to do so. The Naked Wedding Cake is normally decorated with fresh seasonal fruits and berries, with a dusting of icing sugar but again we can introduce fresh flowers instead (or both even!). If you’re wanting fresh flowers, it’s worth checking beforehand with your florist that they’re suitable as some flowers aren’t due to their toxicity. Finally, the cost of your wedding cake will depend on its size and style. 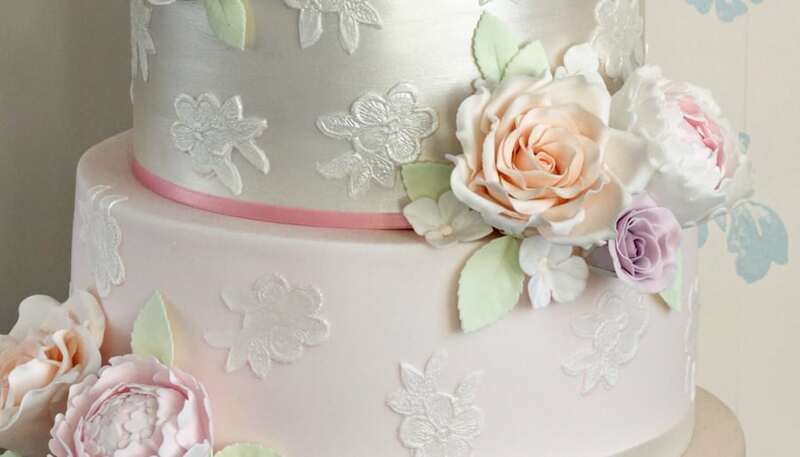 Our cakes are all individually designed but to give you an idea a 3 tier iced wedding cake with a ribbon trim to serve approximately 100 guests would start from approximately £325. Our Naked Wedding cakes start from £225. So, If you’d like a super-scrummy, gorgeous Sticky Fingers Cake Co wedding cake please go to our ‘Enquiry’ page, give us a call, or drop us an email to book a consultation. You can visit us here at Sticky Fingers Cake Co HQ in Westcliff on Sea or if you are local, I can come to you.